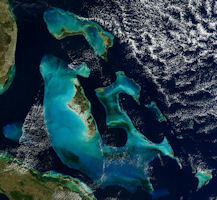 The Caribbean Sea looks blue because the sunlight is scattered by the water molecules. 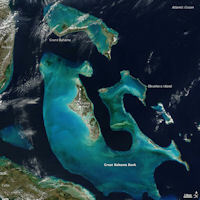 Near the Bahama Islands, the lighter aqua colors are shallow water where the sunlight is reflecting off of the sand and reefs near the surface. The Bahamas is a major tourist destination with cruise ship ports of call for Nassau and Freeport and an assortment of luxury resorts including the world renowned Atlantis resort. Over six million U.S. citizens visit each year. 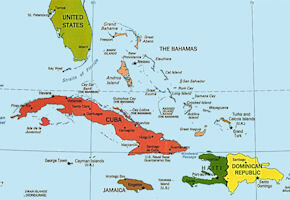 Approximately 80 percent of the tourists visiting The Bahamas are US citizens. CIA World Factbook reports "Royal Bahamas Defense Force: Land Force, Navy, Air Wing (2011)" But the Royal Bahamas Defence Force (RBDF) is unique in the Caribbean - it is an all naval formation with an attached air wing and a Commando unit. 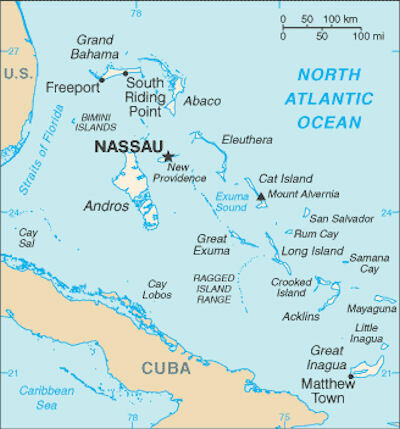 The Bahamas does not have a separate army or air force, as the navy composes the entirety of the Royal Bahamas Defence Force. 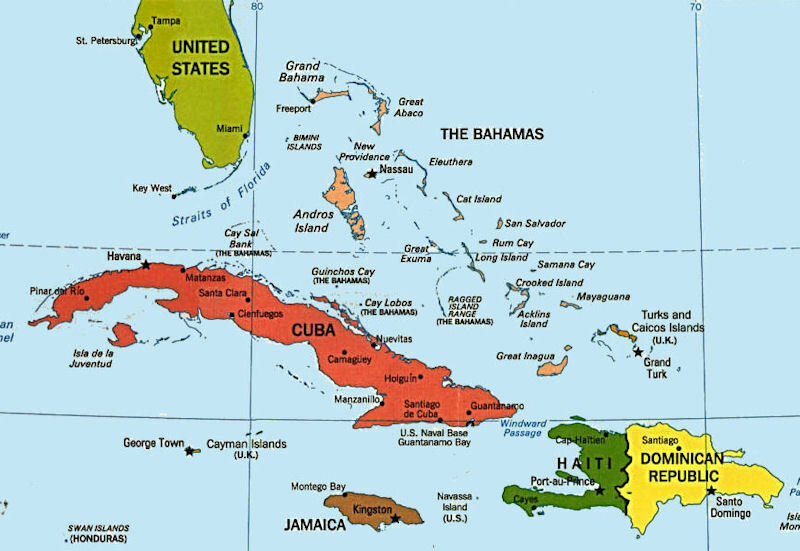 The Bahamas stands out among the Commonwealth Caribbean nations because of its relative wealth and prosperity, political stability, and close proximity to the United States. The Bahamas also bears the distinction of being the first of the Caribbean islands discovered by Columbus in 1492 on his first transatlantic voyage in search of a new route to India. Several islands in the Bahamas have been named as Columbus's first landing site in the Caribbean, but until very recently, Watling Island was the most widely accepted location; in 1926 it was renamed San Salvador, the name bestowed by Columbus himself. In 1986, however, after an extensive five-year investigation, a National Geographic Society team announced that Samana Cay, a small isolated island in the far eastern Bahamas, was the most probable location of Columbus's first landfall. Because of its location, the country is a major transshipment point for illegal drugs, particularly shipments to the US and Europe, and its territory is used for smuggling illegal migrants into the US. Authorities automatically placed under investigation police officers involved in shooting or killing a suspect. Police investigated all cases of police shootings and deaths in police custody and referred them to a coroner’s court for further evaluation. The Police Complaints and Corruption Branch, which reports directly to the deputy commissioner, is responsible for investigating allegations of police brutality or other abuse. In addition to the Complaints and Corruption Branch, the independent Police Complaints Inspectorate Office investigated complaints against police, but the government did not provide updated statistics in 2016. Public protests and demonstrations are infrequent and do not tend to be violent in nature. However, limited law enforcement resources make rapid response to public disorder difficult, particularly on islands other than New Providence. Visitors should protect themselves by avoiding demonstrations. Strikes are generally limited to “industrial actions” or work-to-rule actions and slowdowns. The airports have also seen instances of “Go Slow” non-protest actions resulting in considerable delays by incoming and outgoing flights. Some major streets do not have adequate shoulders or even passable sidewalks, compelling pedestrians to walk in the right-of-way. Motorcyclists frequently swerve through slow traffic and drive between lanes of moving vehicles. It is not uncommon to see poorly maintained or excessively loaded vehicles on roadways. Passengers regularly ride in the bed of trucks without any safety restraints. Roads on the outer Family Islands can be narrow, winding, and in poor condition. The 2015 was the most deadly year in Bahamian history. The Bahamas sustained remarkably high levels of violent armed crimes in 2015. The Royal Bahamas Police Force (RBPF) continued administering policing methods, which included indiscriminate armed-checkpoints and a robust crime reduction plan in tourist areas. The preponderance of violent crimes reported were perpetrated against local Bahamians, and these occurred in areas of saturated criminality and not typically frequented by tourists. Nevertheless, despite strenuous anti-crime incentives sanctioned by the government of The Commonwealth of The Bahamas during the past year, New Providence witnessed a substantial increase of violent armed crimes in locations that are also heavily frequented by US citizen tourists. In many instances, these incidents resulted in fatalities. Armed robberies, property theft, purse snatchings, general theft of personal property, and sexual assaults remain the most common crimes perpetrated against tourists. Although forced entry of residences is a concern, the combination of a residential alarm, anti-burglar grill-work, neighborhood watches and roving security patrols have proven an effective deterrent. 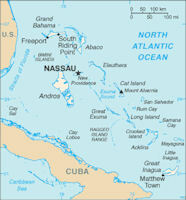 Home invasions, theft, and robbery are not confined to any specific part of the island. Much of the violent crime on New Providence Island happens in non-tourist areas referred to locally as “Over the Hill.” These areas are generally south of the downtown Nassau area south of Shirley Street. These areas are not clearly defined but encompass the lower income areas on New Providence.